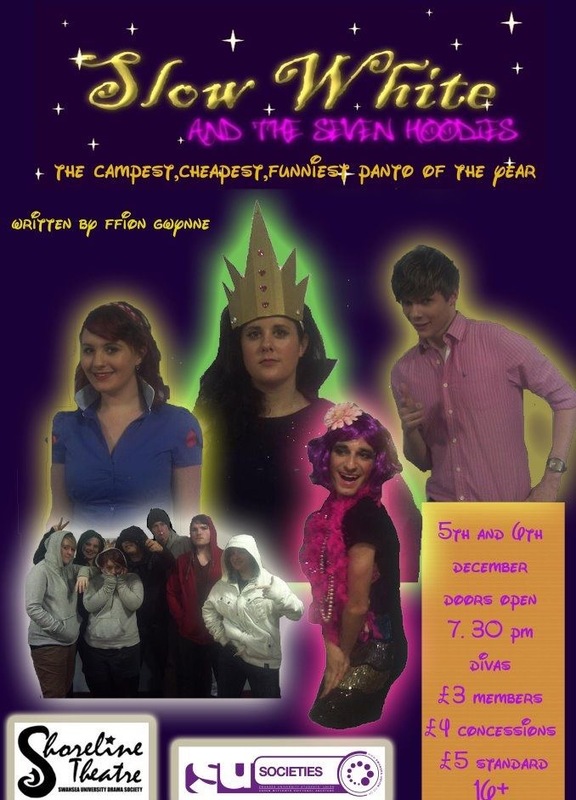 Written by Ffion Gwynne, with script editing by Hal Ginnings, Slow White and the Seven Hoodies is a hilarious pantomime based on the fairytale of Snow White. Swapping the seven dwarfs for seven jobless miscreants (who wear Hoodies), and inserting numerous pop culture references, the play follows Slow White who falls in love with Prince Charmin’ and eventually overthrows her evil stepmother, Queen Evilynn, to win back the kingdom and live happily ever after. It was written and directed by Ffion Gwynne and Hal Ginnings, and performed on Monday 5th December and Tuesday 6th December at Divas, Swansea University. Hal Ginnings made an unexpected cameo appearance on the second night as a half-naked fairy.